Well, it’s been an eventful start to 2015.. In January, I had an appointment at Stepping Hill for a gastroscopy to check for oesophageal varices; new veins created by portal hypertension to relieve blood pressure, which have foolishly attempted to go via the oesophagus. They’re exposed, and a bleed risk, so the doctors wanted them dealt with. They also prescribed me with beta blockers, to try and keep my blood pressure low and lessen the impact of the portal hypertension. I argued that my blood pressure was already pretty low, but they wanted to try anyway. The only other ‘cure’ is to transplant the liver. Then on January 27th, I woke up sweating, but unable to stop shivering. My brain was also not working too well, and I was pretty incoherent. I had a bloomin fever! I managed to drag myself out of bed and into some clothes by midday, and my father in law came by to drive me to A&E. I only live 5 minutes walk from the hospital, but it may as well have been 25 miles away – I could barely walk. I got to the reception and made my usual excuses.. fever, PSC, been told to get blood test whenever it happens.. When the nurse came to determine triage, she sent me straight through, where they got me on a bed and into resusc. My temperature was something like 38.6! They got a cannula in, and added saline, paracetamol, and an antibiotic. I think I must’ve been in there for about half an hour before my fever started fading. It’s hard to say. After that, the hospital stay was much like before. Scans and tests showed that I had something stuck in the end of my main bile duct, but it looked tube-like, and my duct hadn’t dilated like it should do. People again wondered if I had a stent in place or not. Eventually, an MRI scan proved that I didn’t, and that it was just gall stones, and that my bile duct hadn’t dilated because it was actually strictured from the PSC. At this point, I was feeling quite well. 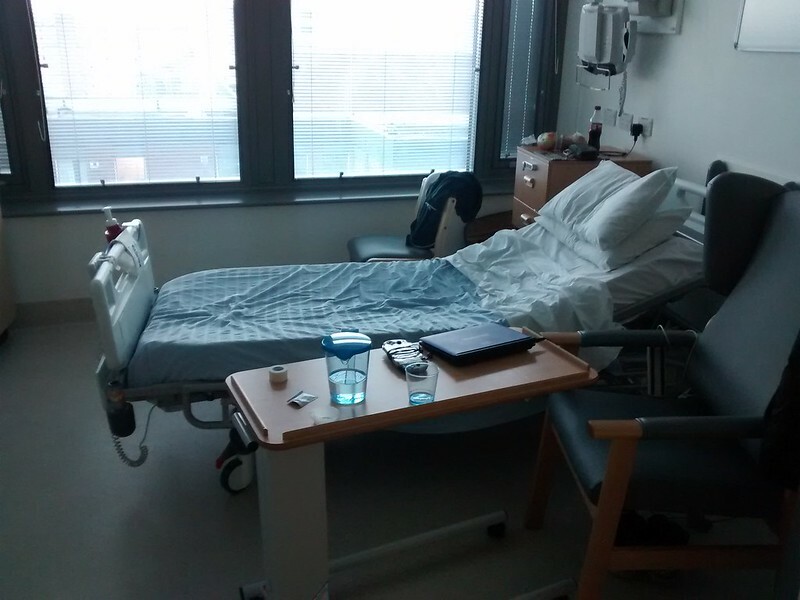 My temperature had been stable for a week, and I was eating and drinking normally, so they decided to let me go home while they consulted with Leeds to decide on the next course of action. I had to take antibiotics for the whole time, and I wasn’t allowed to do anything strenuous or go too far from the hospital, but it was so nice to get some time at home after 2 weeks in hospital. The decision was made on Wednesday 11th Feb – I was to have an ERCP at Leeds, who would also re-assess me for a liver transplant. They booked me in for the 22nd Feb, which was the exact day that my sick note and antibiotics supply expired. phew! The visit to Leeds was for two things; they were going to do an ERCP to have a look at my bile duct, and decide if the stones can be removed, and if a stent is necessary. They were also going to repeat some of the tests from July last year, to re-assess if I should be put onto the liver transplant list. Being infectious had it’s downsides, though – it meant that I couldn’t have appointments in between other patients, and so all my appointments were at the end of the day, and took longer to arrange because of having to be at the end of the list. As a result, what probably should’ve been a 3 day stay turned into a 5 day stay, and I only just got out before it became a 6! I was glad to be out, too. Leeds is a great hospital in many ways, but their food is AWFUL if you’re a vegetarian. Well, unless you really, really like omelettes.. But get out I did! The ERCP was a success; the stones were removed, and they added a metal stent which will last for a year before needing to be replaced. I’m now also on the liver transplant waiting list. I believe the reasoning is that according to blood tests, my liver isn’t coping too well, and they can’t be certain about how long it’ll stay working at a comfortable level. Better to be on the list and be deferred than for things to suddenly get bad and not be on the list. They’ll probably go into more detail when I go to Leeds later on this month, for a meeting about the decision. I hope the doctor’s got answers, coz my wife has sure got the questions!